"We are excited to start the year on a high note by welcoming Via Airlines and announcing the continued expansion of our airline and route network”, said Kevin A. Dillon, A.A.E., Executive Director of the CAA. "Pittsburgh is an important destination, especially for those traveling on business. This new nonstop, however, will bring benefits to both our business and leisure passengers by offering a cost-effective and convenient option to travel between the two cities. 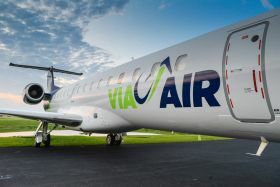 We look forward to our partnership with Via Airlines and their success at Bradley International Airport." Via Airlines is a domestic airline offering daily scheduled flights across the U.S. Via Airlines was the first airline to be certified under new FAA safety regulations, ensuring the highest level of safety in the aviation industry.